Today, I had a wonderful day doing webcasts (more accurately, distance learning & teleconference) with Region XI Library and Media Services. The staff there is so sharp and helpful. The more I work with this group, the more impressed I am with them. The weather here has changed. Yesterday was so nice. Today it turned cold, and according to the news/weather, severe weather is in the works for tomorrow, when I am scheduled to be at the Texas Civil War Museum. This afternoon, I did manage to squeeze in a visit to the Kimball Art Museum (Biblical Art) and Amon-Carter Museum (Russell-Remington). Of course, these fine museums also had many other works displayed. My head is still spinning from sensory overload. I wish North Louisiana had culture like this. One of the most interesting finds I made was of some work by a Confederate soldier who was an artist, Conrad Wise Chapman. A portrait of the artist and one of his paintings is below. I found a great site, http://www.cottage-industries.com/Merchant/default5.htm that says this about him: “Conrad Wise Chapman was born in Washington, D.C., in 1842, second son of the artist John Gadsby Chapman. 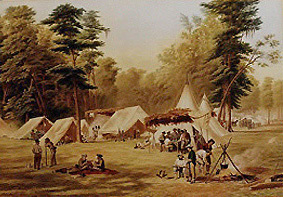 The elder Chapman was already well respected, especially for his oil on canvas The Baptism of Pocahontas, placed in 1840 in the United States Capitol rotunda. In 1848 the family moved to Europe taking up residence in Rome. While in Europe, John Chapman taught both his sons, Conrad and John Linton, to paint. When news of the Civil War reached Rome, Conrad rushed to join the Confederacy.